It is becoming more and more obvious to urban dwellers in Vietnam, especially during the last ten years, that they are facing ever-increasing risks from the impacts of climate change. Vulnerability to climate change is not merely a matter of numbers and figures in the World Bank’s reports, but can be felt acutely in many cases by local Vietnamese people, such as in the devastation caused by intensified and out-of-season floods, droughts, and storms on people’s lives and livelihoods. The Asian Cities Climate Change Resilience Network (ACCCRN), funded by the Rockefeller Foundation and technically managed and coordinated by the Institute for Social and Environmental Transition (ISET), officially started working in Vietnam in 2008 with the engagement of three medium-sized cities Can Tho, Da Nang, and Quy Nhon (Binh Dinh province), with intervention projects starting in 2010. The following are highlights of some results and achievements of ACCCRN implementation in these three cities. In 2011, a Climate Change Coordination Office (CCCO) was established in each of the three ACCCRN cities in Vietnam, Can Tho, Da Nang and Quy Nhon. The CCCOs helped to facilitate cross-sectoral and cross-level coordination of climate change planning and actions in their cities, breaking through the silos of existing practices by bringing the different sectors into discussion. They played an active role in integrated climate action planning and implementation to address identified gaps and priorities of each city. Through the seven years of ‘learning and doing’ under ACCCRN, the capacity of CCCO staff has been greatly enhanced, especially in integrating the perspectives of multiple sectors and stakeholders into this understanding, and applying this knowledge to support decision making. The CCCO staff are also well versed in resilience concepts and thinking, and highly skilled in management of climate resilience projects, coordinating and facilitating the engagement of different technical partners and stakeholders, and building working relationships and convening networks. The CCCOs’ role and expertise are recognized by the local government and technical departments in their own cities, and their model of operation has gained recognition by other cities such as from Ha Tinh, Ho Chi Minh city, Mekong delta provinces, as well as other cities in Laos and Thailand). Coastal areas in Vietnam are under the high risk of flooding due to the impacts of climate change, especially for urban areas with high construction density. Urban development in low-lying floodplains leads to the shrinkage of water surface for flood storage and blockage of flood drainage. According to the flood modeling and urban development simulation of the Da Nang study, the water level in Da Nang (at Cam Le station) is predicted to increase by 0.62 cm by the year 2030 under the combined effect of climate change and full implementation of the existing urban master plan. A case study under the hydrology project in Quy Nhon confirmed that increasing construction in the floodplain is the main reason for historical flooding in Nhon Binh and Nhon Phu wards of the city following typhoon Mirinae in 2009. This, together with results from hydrological modeling under climate change scenarios and with the implementation of current master plans and project plans in the lower Ha Thanh, suggested that existing and low-lying residential areas of Quy Nhon city were also facing very high flood risk due to climate change and urban development. The result of these studies provided the foundation for recommendations to the Da Nang city and Binh Dinh province to modify their urban master plan to provide for widening of floodways and maintaining/improving most of the existing low-lying rural areas; adjusting land use planning in riverine areas to adapt to and minimize risks from future urban flooding. Both Da Nang city and Binh Dinh province had modified their urban master plans to the effect intended by our studies’ recommendations. Modifications to Da Nang’s urban master plan was approved by the Prime Minister in decision no. 2357/QĐ-TTg dated Dec 04, 2013, and to Binh Dinh’s urban master plan in decision no. 1703/QĐ-TTg dated Sep 23, 2013. In Da Nang, the context climate change and growing economic development are posing higher risks to the city’s water resource security. There has also been growing tension between Da Nang city and its neighboring province Quang Nam related to flood and water resource management in the shared river basin (of the Vu Gia – Thu Bon system). Our assessments of current and future conditions of water balance in Da Nang confirmed that the city needs to diversify its water supply resources in the face of increasing demand, hydropower reservoir operation, and growing climate stresses on the quantity and quality of surface water. Furthermore, the research also points out that there need to be a mechanism for basin-level integrated management of the water resource for the benefit of both Da Nang city and its upstream neighbor, especially regarding upstream reservoir management. The idea of setting up and strengthening an inter-provincial platform for water resource management of the Vu Gia – Thu Bon river basin will be actualized by a follow-up project by ISET, called River Basin Cross-border Flood Resilience Support Platform, starting in Feb 2017 and funded by the Global Resilience Partnership (GRP). This new platform is expected to build understanding and collaboration between the Da Nang and Quang Nam to resolve existing conflicts related to flood control and water resource, and to frame/reframe their local policies and plans to facilitate mutual development and resilience, especially for the benefit of poor, vulnerable and marginalized communities. Housing sector damages account for a major part of economic losses caused by storms and typhoons in the coastal city of Da Nang, evidenced by typhoons Xangsane and Ketsana in 2009, and typhoon Nari in 2013. However, investing in typhoon-resistant features in house construction was not a common practice among low-incomers in the city due to their limited financial and technical capacity. Typhoon-resistant housing is therefore a priority area of action for Da Nang, actualized by the ACCCRN project started at the end of 2011 titled Storm-resistant housing for a resilient Da Nang city, which set up a revolving loan program and provided storm-resistant architectural design for more than 400 poor and near-poor households to build a storm-resilient house. The effectiveness of these efforts was clearly demonstrated through the events surrounding the typhoon in Nari in October 2013. Despite the exceptional severity of this typhoon, there was no damage to any of the 244 beneficiary households that had finished their house construction at the time. Da Nang People’s Committee, as recommended by the Da Nang Women’s Union, had issued the regulation requiring storm resistant standards to be integrated into post-typhoon recovery programs and into the construction approval process. This project was internationally recognized as an innovative on-the-ground solution for climate change when becoming one of the 12 winners of the 2014 Lighthouse Activity Awards by UNFCCC, honored at UN Climate Change Conference in Lima, Peru in 2014. Ms. Phan Thi Lan—owner of a storm resistant house shares her satisfaction of her house standing strong after Typhoon Nari swept through Da Nang the day before in 2013. This is one of many houses under the Storm Resistant Housing for a Resilient Da Nang City project. After the typhoon, there was no damage to any of the 244 beneficiary households who had finished their house construction/retrofitting at the time. ISET has been supported to conduct additional research and replication of this housing program such as a feasibility study funded by the ADB and a research and replication project funded by the Nordic Development Fund (NDF). The City Resilience Strategy of Da Nang (developed under the 100 Resilient Cities program, recently released for implementation starting September 2016) also identified the housing sector as one of the core areas of priority actions, which will draw more attention and resources towards these needed interventions. This project worked with vulnerable communities in Nhon Binh and Nhon Phu wards to improve their capacity for flood risk reduction and put in place a system for collecting flood data in flood monitoring stations upstream of Kon and Ha Thanh rivers, to facilitate quick transmission and processing of these data for prediction of downstream flood risk, to provide timely warning information to the communities through a special SMS message protocol, and community response groups to ensure safety for the most vulnerable in the communities. The communities participated in training activities and developed their own flood response plans. A system of more than 20 road markers, signboards and flood measuring posts were installed in the communities. A multi-purpose flood shelter was designed with community inputs and built in Nhon Phu ward to accommodate 200 people. Through engaging local communities in the planning and action, this mechanism enabled effective response and flood risk reduction for the most vulnerable in the communities. The recent flood event in Binh Dinh province in October 2016 was a practical test of this model. It proved to be effective in enabling the community to have timely and appropriate responses to the flood situation. After receiving warning messages, the 304 households in Nhon Phu ward proceeded to the safe shelter and stayed there for two days and one night, from October 3-4. With timely SMS messages, households were aware of the severity and persistence of the flood, and so they did not leave the safe shelter too early, which would be dangerous for them. Given the success of this project, Binh Dinh province received additional support from GIZ to install additional flood monitoring equipment in other stations in the Kon – Ha Thanh river system. Although located about 65 km inland, Can Tho city is still faced with more and more visible risk of salinity intrusion during the last decade due to the development of hydropower upstream of the Mekong in China, Cambodia and Laos, and rising sea levels caused by climate change. The city was supported to set up eight stations to monitor salinity levels and detect saline intrusion both from the East Sea (Hau river) and the West Sea or Gulf of Thailand (Rach Soi-Cai San canal and Xang Xa No canal). Two of these stations are located outside the border of Can Tho city towards the West sea to allow early detection of salinization risk. Drought and saline intrusion has been worsening in Can Tho city, evidenced in the dry season of 2015 and 2016. From March 4-14, 2016, the salinity level climbed over the threshold at Cai Cui station, Cai Rang district of Can Tho. The highest level of salinity was 2.05 ‰ which was recorded at 06:00pm on March 5, 2016. This was the first time threshold saline intrusion was recorded in the history of Can Tho city (1‰ is Alarm level 2 for salt sensitive plants). The monitoring system put in place by the project helped the city to keep track of and respond in a timely way to the heightened saline intrusion risk. Assessment indicated that a new two-way dam was urgently needed at the location of the former earthen Dat Set dam to prevent the saline water from intruding further and to protect local livelihoods, which depend heavily on fruit tree planting. The construction of this dam was completed late June 2016, about four months after the threshold salinity level was recorded at Cai Cui station. In Can Tho city, the increase in incidence and severity of dengue fever outbreaks, and their tendency to occur around the year both the rainy and dry season, are associated with a range of factors, from urbanization and increased rural-urban migration to increased flooding and climate change impacts such as temperature, rainfall, and humidity. The ACCCRN study conducted by ISET and Can Tho city experts confirmed that the rise in Can Tho’s dengue cases has a strong link to the increase of humidity and precipitation due to the changing climate. The result of this study provided the basis for ISET, Can Tho’s Preventive Health Centre and the Can Tho CCCO, to design and implement intervention actions, which focus on integrating climate change factors into the operation of the current health preventive system of the city. Part of these actions was to establish community health clubs of about 50 members in four project wards to support monitoring of dengue fever preventive actions at the household level, and public education to change local attitudes about preventing dengue fever. Health club members pay regular visits to homes and instruct people on measures to eliminate mosquitos and larvae. They also administer checklists of 19 specific dengue-prevention actions. Initiated by ISET with the support of the Urban Development Agency (UDA), and officially established in December 2011 under the purview of the Vietnam Urban Forum, the Urban Climate Resilience Community of Practice (UCR-COP) offers a forum for urban practitioners to share and learn from the ongoing efforts by diverse stakeholders in building urban climate change resilience in Vietnam, aimed at promoting urban resilience practice, and supporting the integration of resilience thinking into national policies. Starting with a working group of 10 core member organizations, the UCR-CoP is now a 400 strong community facilitated by ISET, with about four sharing events held every year, a quarterly newsletter, and a website with over 17,000 views so far. The topics of the sharing events are areas that participants are working on or are interested in, such as flood management and urban planning, capacity building, urban disaster risk management, climate resilience for peri-urban areas, climate-proof housing, and urban resilience indicators. 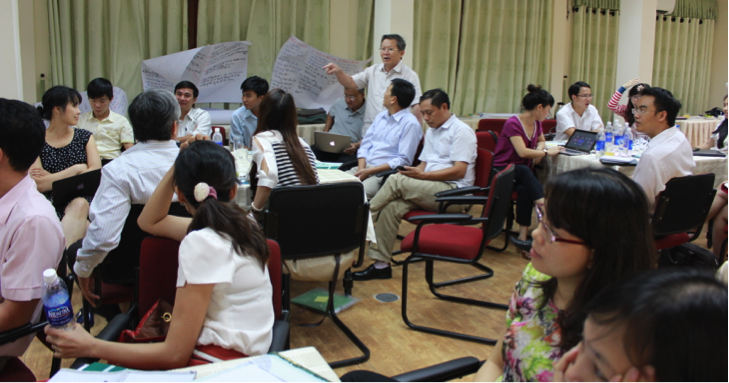 With the active participation of national level agencies such as the Urban Development Agency (UDA – Ministry of Construction), the National Institute for Science and Technology Policy and Strategic Studies (Ministry of Science and Technology) and the Vietnam Institute of Architecture, Urban and Rural Planning (Ministry of Construction), UCR-CoP provides opportunities for members to engage in policy dialogues and advocacy at both the national and local levels. Through this platform, ISET has been successful in promoting the use of ACCCRN tools and methods in urban planning and disaster risk management by our partners, such as UDA in developing urban development plans and policies, and American Red Cross and Winrock International related to planning for urban disaster risk reduction. It is expected that UCR-CoP will continue to provide the momentum for active sharing and exchange of insights and experience, and further promote resilience thinking and practice among urban practitioners in Vietnam. Please also read its infographic in this link. ISET-Vietnam, please find original post on acccrn.net here. This entry was posted in Climate Change, disaster risk reduction, English / Tiếng Anh, flood management, urban planning, Urban resilience and tagged ACCCRN, can tho, climate change, Da Nang, quy nhon, Urban planning, urban resilience. Bookmark the permalink.